Latest update November 18, 2018. Currently working on a blacksmith's newsletter. First issue focuses on getting the new smith started. Some of the material from the newsletter will be added to this website soon. Planning to add a second newsletter with more how-to stuff for blacksmiths later. Best new material will be added here also. Fire & Roses is an amateur video documentary showing our team of blacksmiths forging a rose from a solid bar of iron. Using only the traditional techniques taught to German blacksmiths for hundreds of years. This is not a sheet metal rose, nor is it a bar that was smashed flat and rolled up as seen on other blacksmith websites. This is the real thing! Performed live for a small audience from Calontir in October of 2002. The Fire & Roses video DVD is now available for purchase by both internet and mail order. Click on the picture at left or follow this link: http://www.beautifuliron.com/ironrose.htm for more details on the video and ordering instructions. Beautiful Iron (formerly known as Horsefeathers & Hammermen) is dedicated to the display of tools, work methods, and products of the blacksmith, and to the use of horses as the main source of power on a farm. This is a private website that is open to viewing by the public. There are no professional writers here. Many of the pages and photos on this website were created during the era of slow dial-up connections that most people had at the time. Most of the photos on this site have been replaced multiple times with higher and higher resolution photos as internet connection speeds increased. All remaining low resolution photos will be replaced with higher resolution photos as time permits. With the first Coal Forge pages being written during the spring of 1998 and first published to the web in May of 1999. Nowhere else can one find so many shops and equipment showcased as they are on this site. With literally hundreds of photos of coal forges and blacksmith shops, a foundation of knowledge was created to be shared and to support the forge designs and theories described in the treatise on Forge Design for blacksmiths that can be accessed by following the links in the Forge & Fire section. This site has grown to include other aspects of work which I, or friends of mine, are involved in. There is something for everyone from beginner to highly advanced ornamental ironworkers. Updates are made as materials are gathered and time permits. This is a work in progress and will continue growing as more photos and material is added, so visitors are invited to check back often. 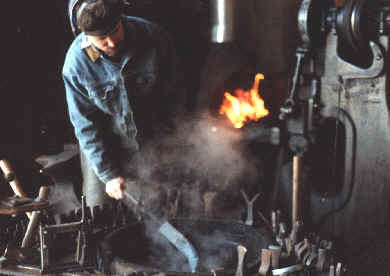 Building on the history of the blacksmith's trade, this website offers a tremendous amount of information and documentation to help other smiths to build their own forges and to see forges other smiths have built. Created by a blacksmith to help other blacksmiths, this website is unlike any other. The photos of forges and design theories cannot be found anywhere else on the internet. The photos show blacksmith's forges (hearths) from around the world. Many professional shops and a few museum shops that tried to recreate period blacksmith shops. Often people who have seen my work will ask specific details of how I make my tools, built a coal forge, and learned the trade. More often still they ask me how they can learn the art and where, how, and what to get to set up a little shop of their own. The result was that I often needed to carry about 60 pounds of books and photos and videos everywhere I went. Many of these photos and other references are now posted here on this website so friends can find them at their own leisure and I no longer must carry so much stuff around with me. My background. My name in the SCA is Hans Schlosser. I'm an ornamental blacksmith or gatesmith working on all sizes of wrought iron ornamental gates and railings and other items. I am also a mechanic and for those of you who just have to ask, yes I shoe horses- with a preference for heavy draft horses. 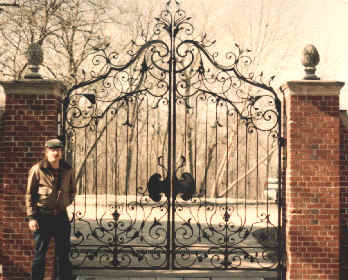 Gates and decorative work are my main focus along with draft horse shoeing and manufacturing heavy duty hardware and repairing machinery used with draft horses. Future plans for this site include: We have a huge number of things planned now that the Fire & Roses video is done, but before any more work can be done I must first complete the archiving of a large amount of photos and video from video tape onto DVD, some of these videos will be added here for free viewing later. After that we can begin planning more blacksmithing and class related projects as well as new material for this website. What's next for this website? Rewrites and new material for the Forge Design series, new higher resolution photos to replace many of the older low resolution photos on many of the Coal Forge pages, a new page addition for the Drills pages and new photos for the current lineup of Drills pages, a page or two on forging blacksmiths' tongs, and finally a full re-organization of the Links pages into a format that makes them easier to read and locate specific subjects. I have literally hundreds of new photos to be added on this website - around half of them replacing the low resolution photos that have been on this site for more than a decade - and the other half of the photos are of entirely new materials and subjects. And finally, I will begin showing some of my own ironworks here and offering some of the smaller pieces for sale on this website - this being the original intent of the name of this website - "Beautiful Iron." Updates: More new material plus upgrades of older items on this website are added frequently. November 18, 2018. Currently working on a blacksmith's newsletter. First issue focuses on getting the new smith started. Some of the material from the newsletter will be added to this website soon. Planning to add a second newsletter with more how-to stuff for blacksmiths later. Best new material will be added here also. November 18, 2018. Website will be rebuild will be delayed for some time yet. I was planning to switch to new website software but currently have no time to learn to work with it. The new software is much more complex than the 20-year old software that I originally built this website with years ago. For now I will continue with the old software. Best DPI screen resolution to view this site is currently 1920 x 1080. If the photos and text appear scattered in odd places on your screen, it might be because your screen resolution was set differently than the one I used to create the website. I am hoping that new website software can help fix this problem automatically so that everyone's screen will display photos and text correctly no matter what screen resolution they use. February 9th, 2014. Working on much-needed updates and re-writes for multiple webpages. Anvils page is first in line to get most of the re-writes. New photos will be added soon. December 18th, 2013. And finally, I can once again access my own website. What a wild year. Multiple computer problems culminating in purchasing a complete new system and upgrading to more modern programs. But for over a year this site was crippled by the lack of a single piece of software that was compatible with the new security upgrades put in place by my host. Now finally I can begin making some updates. January 13th. 2013. Workload is still too heavy to allow updates to this website. Still waiting to find time for adding dimensions of post drill stands. Have 3-D drawing program and AutoCAD ready to go, but no time to get accustomed to the newer version of AutoCAD. September 26th, 2012. Workload does not permit time for website updates. Lots of new material to add but no time to do it. All computer problems repaired. Next on the list will be the finished dimensions of the post drill stands. Expect time to add new material some time around November. March 3rd, 2012. Unable to update website due to chronic computer problems and heavy work load. I hope to begin updating website during the next couple of months. The free-standing post drill stands are nearly finished and plans for these will be likely be posted here before other updates. Spring comes early this year. Machine repair comes before website updates. I am sorry for the delay. October 23rd, 2011. Updated sale page here: Blacksmith's Tools For Sale with two new (old) drill presses for sale. Look for more blacksmith's tools and machines for sale here later. September 17th, 2011. New photos added to the Post Drill page. These photos include a Canedy-Otto Number 19 post drill and a Buffalo Forge Number 61 post drill - both from a recent visit to the Prairie Trails Museum in Corydon, IA, USA. Contact information is also included in the articles. Work is nearly complete on building free-standing posts for installing and working with the post drill. 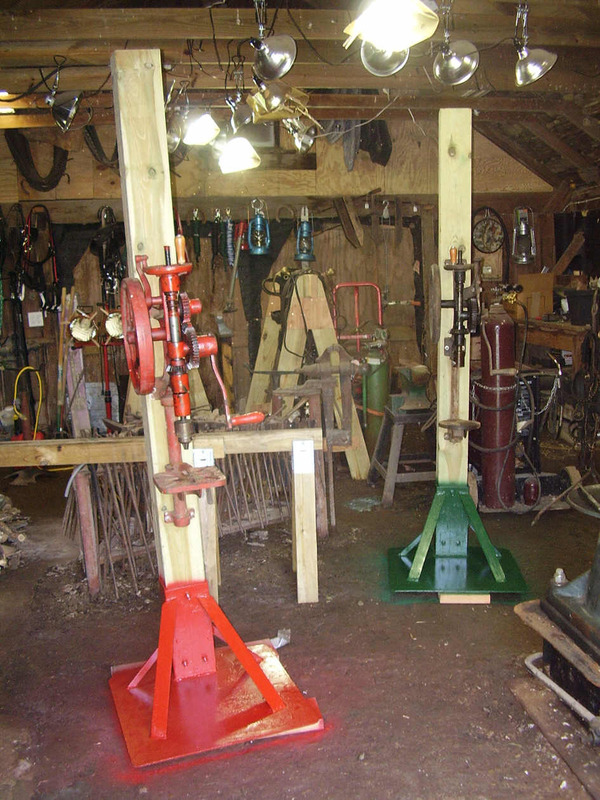 The free standing posts allow the drills to be used anywhere as though it were a modern drill press. Dimensions and drawings will be added soon. Downloadable PDF files of two Canedy-Otto catalogs have also been added. September 10th, 2011. New photos added to the Post Drill page. The page was also improved with details on setting up a post drill at the proper height for easiest and most efficient work. September 9th, 2011. Updates and new photos coming soon. July 13th, 2011. All updates are on hold due to heavy workload. Two new post drill stands have been built and are complete. These will be photographed and construction drawings and dimensions added later. A new page section will also added later with details describing how to determine proper mounting height for a post drill. March 21, 2011. Large updates and new additions in progress for the Ye Old Drill section. The Post Drills page will be updated with new photos and drawings after construction work in the shop has been completed. February 25th, 2011. Large re-write to make troubleshooting section easier to read on the STC-88 Air Hammer page. Tools For Air Hammers section also re-written and improved with new sources of tooling for air hammers added. This has been a very busy winter season, and I have had to postpone many of the upgrades for the shop and delayed some of the post drill page updates. I hope to finish construction soon on the new post drills installation seen in the photo below, and later add these updates to the Post Drills page. This will include video of operation of these drills to help introduce the neophyte to how these drills work and how to bring a neglected drill back into service and install a post drill in the home shop. February 4th, 2011. Construction of free-standing posts for mounting and using post drills - is nearly complete. These new posts have already turned out to be much better than expected. New photos, dimensions, and other information will be added to the Post Drills page soon. January 24th, 2011. Working on construction of a pair of free-standing posts for mounting and using post drills. These will be added to the Post Drills page soon. These posts will allow a post drill to be easily moved anywhere in the shop, and used like a modern upright drill press. November 25th, 2010. Latest NEWS: Contacted Striker Hammer factory rep - putting together a new parts order. We will stock new parts for these hammers very soon. Anyone that has a special parts request - contact me quickly by email, so that we can be sure to include all parts you might need in the first parts shipment. November 11th, 2010. NEWS UPDATE: Recommended oil for the STC-88 Air Hammer now has a new name. See the new Oil Specifications section of the STC-88 Air Hammer page (at top of the Drip Oiler section) for more details. November 8th, 2010. Repaired missing pictures on Chimneys page, Styles of Forges page, and Tools & Storage page. These pages are not finished. This was a picture replacement and link update only. More changes coming to these pages. October 23rd, 2010. Updated and re-formatted Post Drill page for widescreen viewing. October 4th, 2010. Blacksmithing classes are on hold again. Large updates on 6 different pages are currently underway. September 25th, 2010. Updated the Brake Drum forge page. This page still has a lot of work before it is anywhere near finished. The brake drum forge is the poorest and worst quality forge and so this page has a low priority. August 21st, 2010. 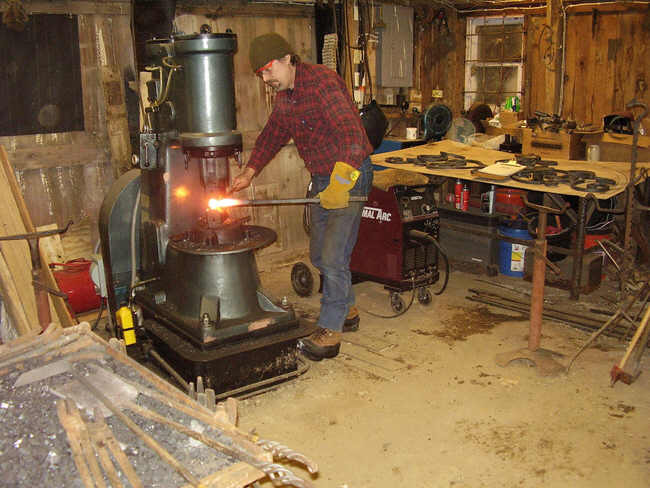 Planning to once again host Blacksmithing Classes & training seminars to prepare beginning blacksmiths to participate in the Capel Garmon Firedog project. July 7th, 2010. Lots of small updates on pages: Steam Show Blacksmith and Steam Power Events Schedule page and Steel & Brick page. June 20th, 2010. Added new photos of a beautiful red Canedy-Otto camelback drill on the Camelback Drills page. This drill appears to be in fully serviceable condition and can be seen in the railcar maintenance area of the main train station at Old Threshers in Mt. Pleasant, Iowa, USA. May 6th, 2010. Large re-write and updates added to STC-88 Air Hammer page. January 18th, 2010. Finished re-write on Post Drill page. New photos added, upgraded some older photos. Older photos that were replaced, had been originally added in the days before high-speed internet connections. The new photos are larger and higher resolution. September 10th, 2009. Editing of the STC-88 Air Hammer page will resume soon. Additional updates will also include new photos for the Post Drill page and the Steam Show Blacksmith page. June 16th, 2009. Current projects leave little or no time for website updates. A new video will become available soon showing the forging of a rose bud using traditional blacksmith techniques. A new camera will solve the blurry video problem seen in our first video. The roses we make are forged using traditional techniques - NOT the smashed and rolled up variety that have popped up all over the internet recently like mushrooms after a summer rain, and not the sheet metal variety made from store bought parts - just real forged roses. More details on this later. May 21, 2009. Current projects include a re-design and re-tooling for iron rose production and video to teach others how to forge a full size rose bud from a solid bar of iron. These are of course the fully forged and carved roses that were once made by master blacksmiths from Europe. Other work has been delayed all year due to high work load. January 14, 2009. The Post Drill page is in the middle of a large re-write and upgrade. This was one of the earliest pages published for this website around 1999. Photos have been replaced with larger versions and new photos will be added soon. December 20, 2008. Photo upgrades completed on Anderson Blacksmith page. Anderson Blacksmith shop is located in Colonial Williamsburg Virginia in Williamsburg, Virginia, USA. The new photos are much larger photos than the originals that I first published in 1998. November 28, 2008. 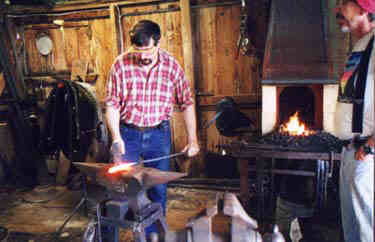 Anderson Blacksmith page has been re-written and some of the photos replaced with higher resolution photos. November 8, 2008. Steam Show Blacksmith and STC-88 Air Hammer pages have updates. The Steam Show Blacksmith page will also host a new set of steam tractor and steam engine photos later. October 21, 2008. The blacksmithing classes were cancelled/postponed once again until my workload allows more time for hosting these events. I hope to have these issues resolved soon. SCA blacksmiths please check the Blacksmithing Classes webpage for future announcements. I will also make announcements through the usual channels where many of you first heard of the classes. October 13, 2008. New blacksmith shop photos and updates and new steam power photos and Steam Show Blacksmith page re-written. October 7, 2008. Large photo update in progress for STC-88 Air Hammer page. Approximately 30 photos will be added to Lubrication and Oiler sections. September 3, 2008. The Capel Garmon Firedog page is updated and complete. This project will begin soon. September 2, 2008. Drip oiler receiving more updates at the STC-88 Air Hammer page. More updates for other pages coming soon. August 24, 2008. Blacksmith classes and seminars will become active again. Purpose is to produce Capel Garmon Firedog at a Lilies War 2009. See Blacksmithing Classes page for future updates. August 14, 2008. Updates in progress. Tongs page gets a minor facelift. A real tongs page (showing how to make tongs) will come during this fall season. May 26th, 2008. Heavy work load has slowed most updates on this site. There is a large ongoing update on the STC-88 Air Hammer page. This large update is a result of dozens of small changes made over approximately 3 months. Most notable is the additional material on use & operation of the drip oiler used on small air hammers. January 24th, 2008. All updates on hold for another 6 weeks due to heavy workload in shop. Lots of new material to add later. November 18th, 2007. More re-writes for the STC-88 Air Hammer page. A lot of repairs and new material added since the last update in August. Additional updates will be delayed as work load in the shop is too great. The latest job is a set of gates that will offer an opportunity for more photos and videos of this hammer in operation, as well as some good material for the ironwork section of this website.